Family Writers Press (FWP), one of the independent media organizations working with Indigenous People of Biafra (IPOB) under the leadership of Mazi Nnamdi Kanu (De Great) hereby issue this press statement to the world in a way of rejecting in totality the bail conditions given by Nigeria Federal High Court Abuja presided over by Hon. Justice Binta Nyako on Nnamdi Kanu, the Supreme leader of Indigenous People of Biafra (IPOB) Worldwide on April 25th, 2017. Family Writers Press hereby describes the laughable kangaroo bail ruling given by Justice Binta Nyako as the height of disgrace and caricature on Nigeria Judiciary before the world, especially before the international judicial arena. It could be recalled that Nigerian government arrested Mazi Nnamdi Kanu since October 14th, 2015 due to his unbendable quest for the restoration of Biafra as a sovereign state and have kept him in an unlawful detention till today. It could be recalled also that a Magistrate Court in Abuja presided over by Hon. Usman Shaibu granted bail to Nnamdi Kanu on October 19th, 2015 and the then stringent bail conditions were met by Bar. Vincent Obetta who was Nnamdi Kanu's defense lawyer as at that time, but the DSS and Gen Muhammadu Buhari of Nigeria on the other hand refused to release him after meeting his bail conditions. Mazi Nnamdi Kanu was later discharged by Hon. Usman Shaibu after arraignment in the Magistrate court where the DSS was unable to substantiate its allegation of Criminal Conspiracy against the Nigerian state on Mazi Nnamdi Kanu but Gen. Buhari still ordered that Mazi Kanu will not be released to enjoy his freedom. The DSS went ahead to detain Mazi Nnamdi Kanu until they later arraigned him again in the Federal High Court Abuja, Nigeria, presided over by an incorruptible Judge, Hon. Justice Adeniyi Ademola on allegation of terrorism sponsorship and dumped Criminal Conspiracy preferred on Mazi Kanu in the previous Magistrate Court. After hearing the arguments from the both counsels led by Mohammed Diri (DPP, Nigeria Min. of Justice) representing DSS and Nigeria FG and Bar Vincent Egechukwu Obetta representing Mazi Nnamdi Kanu and Biafra, the incorruptible Judge, Hon. Justice Adeniyi Ademola first condemned the rationale for detaining Mazi Kanu unlawfully for 90 days which already violated his fundamental human right as a citizen as stipulated in Nigerian Constitution of 1999 as amended. He ended his condemnation of the unlawful detention with an adjournment of the case to December 17th, 2015 for ruling. On December 17th, 2015, the incorruptible Judge, Hon Adeniyi Ademola drew the attention of the counsel to the DSS and Nigerian government with a statement which the incorruptible Judge made thus "Next time when you people bring a person into this honourable court on the allegation of terrorism, make sure you bring a real terrorist and not a freedom fighter or activist who preach his ideology on radio station according to evidence before court here provided by both counsels. Terrorists do not stay and preach on radio stations as contained in the evidences of the plaintiff which had it that the accused was broadcasting from a radio station". After these analyses, the incorruptible Judge, Hon Justice Adeniyi Ademola ruled that Mazi Nnamdi Kanu is just a freedom fighter who has no traceable link to terrorism, and should be released unconditionally. Again, Gen Muhammadu Buhari disobeyed court verdict and ordered DSS not to release Nnamdi Kanu regardless of the court verdict. It was on this note that Nigeria government later shifted from terrorism to treason or treasonable felony and arraigned Mazi Kanu again on December 29th, 2015 before Justice Ahmed Muhammed who finally hands-off the case that same day because Mazi Nnamdi Kanu declared that he has no confidence any more on Nigerian courts as Nigerian government has in several occasions disobeyed court orders and verdicts with Nigeria Judicial Council doing nothing to call Nigeria government to order. The case file eventually continued to move until it reached Justice Binta Nyako. Since Justice Binta Nyako became the presiding Judge in the case under reference here, she has indulged in all manner of judicial rascality noticeable in her controversial way of handling the case all these months. (1) Justice Binta Nyako declared that the terrifying and judicial influencing statement made by Gen Buhari as the president of Nigeria will not by any reason constitute an executive interference in the case and that simply showed that she is intellectually dwarf in judicial knowledge by not knowing that such word of the president can influence court. (2) She continued doing verdict somersaults in her rulings against judicial procedures in Nigeria which has it that a court has no jurisdiction to overrule, withdraw, overturn or set aside its verdict unless a higher court does that through an appeal filed in the appellate court by plaintiff or defendant. (3) She quickly denied the defendants bail at the beginning of the opening of the case not considering the enormous damages it may cause the plaintiff to pay in consequence as restitution should the accused person be found innocent after the trial as he has been detained for too long. (4) She continued making all manner of reckless statements inside court room which includes (a) that the court is her own and will do anything she wish whether Nnamdi Kanu like it or not, (b) that she will declare Nnamdi Kanu unrule if he ever talk in the court again and will deny him court appearance subsequently. (5) She continued doing needless adjournment in the case to buy more time for the plaintiff against the judicial procedures. (6) She sneaked in Sharia Law type of secret trial which will feature masked witnesses without the ratification of Attorney General of Nigeria, with satisfiable exhibits contained in an affidavit made available before the court as stipulated by Section 36 of 1999 Constitution of Nigeria as amended. It is in view of all these judicial misconducts and many more displayed by Justice Binta Nyako since November 8th, 2016, when she opened the case file, that Family Writers Press want Justice Binta Nyako to understand that a trial Judge is not a monopoly or island of powers and right vested on courts. It is important for her to understand that it is where the right and powers of the trial Judge ends, is where that of defense lawyers or even a prosecutor begins in a judicial procedures. If Justice Binta Nyako cluelessly believed that a trial Judge is the island or bus stop of the powers vested on courts, then she is heading to intentional career and moral suicide. Family Writers Press hereby once again advise Justice Binta Nyako to resign from her judicial office in Nigeria Federal High Court if she is not educated enough to serve as a Judge, in order to save Nigeria judiciary from further embarrassment due to her display of judicial cluelessness. Whatever she likes, let her be doing in the Nigeria Federal High Court which she has converted herself as the self-styled owner of the court, but she has no judicial powers and right to subject Mazi Nnamdi Kanu, the Supreme leader of Indigenous People of Biafra to such a kangaroo and useless grant of bail. By this bail ruling, Justice Binta Nyako has succeeded in nailing the coffin of the Nigerian judiciary before the world and a laughing stock before international observers. 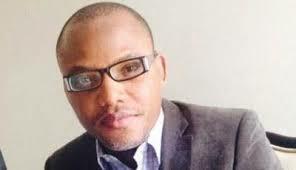 Family Writers Press rejects in strong terms such unconstitutional grant of bail because it’s not just a violation of fundamental human right of Nnamdi Kanu but a way of placing a man who doubles as the Supreme leaders of Indigenous People of Biafra (IPOB) Worldwide and Eastern Consultative Assembly (ECA) in a house arrest for no crime in democratic Nigeria. If she fails to overrule this bail which contains the questionable conditions as she has been overruling her verdicts in the past, then she will risk being dragged to National Judicial Council (NJC) for investigation into what has been blackmailing her in the case or be reported to international judicial arena. (1) To enable him/her go home and prepare for his defense against the accusation levelled against him by the plaintiff because he still enjoy equality in human right with plaintiff before the court. (2) To save the plaintiff from paying an enormous restitution to the accused person should he/she be found innocent after the trial. By the grant of bail, the accused will be at liberty to enjoy his freedom and be doing his/her business and at the same time appears in court on court sitting days. In conclusion, Family Writers Press declares in this Press Release that we reject the bail ruling until the right thing is done by the court.